I decided to be at the Fedora Activity Day at Kalyani Government Engg. College on the last moment. So on 21st February morning ~0530 hrs, three of us (rtnpro, tux_440volt & me) boarded the Durgapur-Kalyani state bus. Well, en-route @ Memari some protestors stopped the bus and then, we had to change three local trains to finally reach Kalyani. 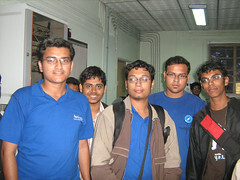 Once there, Rohit (2nd year, KGEC) came to take us from station. We reached the venue at a fairly good time ~1130 hrs inspite of the hackles. While entering the main building, we saw a long queue of people registering for the event, getting their student kits (F10 media, stickers and other stuffs). Was like Fedora everywhere, took some snaps. Without wasting anymore time, we briskly went to the auditorium. Rangeen was there overviewing the event. 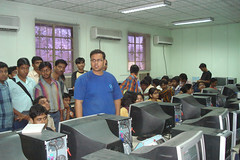 Shortly after Indranil Das Gupta and some college faculties came in. Shreyank and Mitesh from NIT-Durgapur were also there. Couple of college faculties kickstarted the FAD then after. It was nice to hear that the college management amply supported FLOSS though that needs to increase more & more 🙂 Indranil was the chief guest of the event. He then gave a good introduction on “What is *this* all about?”. Then it was time for lunch. Post-lunch, we started our session. We were running one-hour late due to a power-cut though. At 1400 hrs, I started it out with a nice ‘Introduction to Fedora‘. Subhodip did follow it up busting ‘Myths of Linux‘. The two sessions lasted for around 2 hrs. After that we both did a half-an-hour Q/A session. I liked that the number of students were same throughout the day. There were hosts of questions. We showed them about common nitty-gritties, like network, proxy configs, packagekit, look and feel of KDE 4.2. Some were also redirected to Rangeen to be answered in the installfest that was lined up after this. Soon after the installfest started ~1630 hrs. We all went there (it was a CSE lab AFAIR) to have a peek into what was going on. Initially there were around 60+ students which is quite good. We (me and subhodip) had to leave shortly after this. I had my sisters’ wedding reception in the evening and I gotta *be* there at any cost. The installfest formally/informally lasted upto 0200-0300 hrs late into the morning thanks to Rangeen and Ratnadeep. They did a fantastic job. rtnpro did some cool things with his mini mirror-in-a-box 😉 More about it here. And last but not the least, the organizers did a great job to put up the event. They told me that network administration at their hostels was in their hands which was great. Though, all the 5 halls were not interconnected. But anyway, they can have local mirrors for each halls. They have also formed a LUG just yesterday, which will consolidate them more. Photos are over here and here. This entry was posted in dgplug, Fedora, FOSS, KDE, Life. Bookmark the permalink.